The Rohingya are primarily located in the Rakhine state in western Burma. The order, which is currently facing a series of court challenges, would also halt all refugee resettlement in the U.S. for 120 days. Upon resumption of refugee admissions, it calls on the federal government "to make changes, to the extent permitted by law, to prioritize refugee claims made by individuals on the basis of religious-based persecution, provided that the religion of the individual is a minority religion in the individual's country of nationality." In an interview on the Christian Broadcasting Network on Jan. 27, the same day the order was issued, Trump explicitly said it's intended to prioritize Christians. But how would this approach shake out for a nation where the ruling majority is Buddhist and one persecuted minority is largely Muslim? Such is the situation in Burma. Also called Myanmar, the nation is dominated by a Buddhist ethnic majority and governed by a military junta that has historically preyed upon several ethnic and religious minorities. In Rakhine State, in the west of Burma, the military has escalated its attacks on the Rohingya people, a largely Muslim group. Minorities in Burma vary widely in their religious practices, sometimes even within a specific group: Christianity, animism, Hinduism. There's even a longstanding Jewish community in the country, though it is tiny now. And some ethnic minorities are Buddhist. Additionally, some members of the Buddhist ethnic majority, known as Burmans or Bamar, have also fled the repressive regime. But human-rights advocates and the United Nations point to persecution of the Rohingya as especially severe. 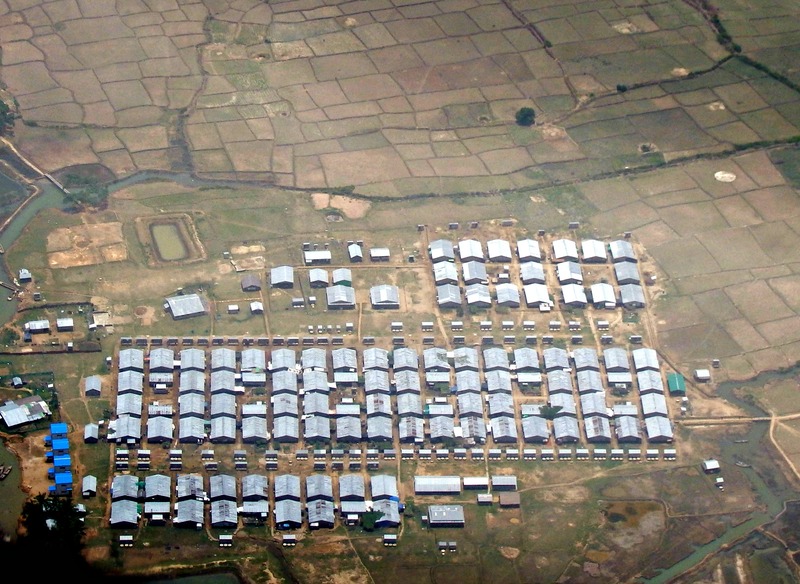 A Rohingya camp is situated near Sittwe, the capital city of Rakhine state in northern Burma. Burma's government recognizes most ethnic minorities it has attacked as having a legitimate presence in the country, but it regards the Rohingya as illegal immigrants, even though they've been in Rakhine State for centuries. The nation has taken some steps toward democracy in recent years, but civilian officials essentially have no control over its military, and civil war continues on multiple fronts. Many pro-democracy activists, including State Counsellor Aung San Suu Kyi, have said little about the Rohingya's plight, and some have even taken the military's side in decrying their very presence in the country. People from Burma have made up the largest group of refugees resettling in Wisconsin in the past decade-and-a-half. While the recent executive order makes no mention of Burma, advocates for the country's oppressed peoples are thinking seriously about how the Trump administration might impact the Rohingya who seek asylum in the United States. "What remains to be seen is how the attorneys that are working in the immigration department, and officers, are going to interpret that provision, whether they're going to go with the spirit of the order, which is essentially a Muslim ban, or whether they're going to go with the letter of the order," said Jennifer Sawicz, a Chicago-based spokesperson for the advocacy group Burma Task Force. Burma seems to be a complete blind spot in the executive order, but it isn't for Congress, said Joshua Kurlantzick, a senior fellow for Southeast Asia at the Council on Foreign Relations. "Myanmar refugees are traditionally in a category along with Tibetan refugees and Cuban refugees" in terms of how U.S. politicians regard them, he said. "Even though certainly it's really rough for them, they do have a lot of advocates in Congress." These advocates include Senate Majority Leader Mitch McConnell, R-Kentucky, who has specifically spoken on behalf of the Rohingya. Burma was also a rare issue on which McConnell had a productive collaboration with the Obama administration. "It's not a Republican-Democrat thing. So Myanmar refugees would have that going for them," Kurlantzick said. That said, few of the Burmese refugees resettled in the U.S. are Rohingya. Rather, these people have mainly fled to Bangladesh, Thailand, Indonesia and Malaysia, nations that want them to stop coming. Bangladesh is currently planning to relocate its Rohingya refugees to Thengar Char, a largely uninhabitable island in the Bay of Bengal. But even with friends in Congress, the Rohingya still inside Burma could suffer even more as a consequence of increasing Islamophobia in American and European politics, Sawicz said. "The Burmese government watches what the U.S. government does," she said. "These types of actions [like Trump's executive order] give them license to intensify their anti-Muslim hate speech and the policies that derive from them. For example when Trump won the election, he was sent a letter by the head of the Arakan National Party in Burma, which said, 'We look forward to working with you because we have the same problems you do, which are Islamic extremism and illegal immigration.'" This is an accurate paraphrase: the actual wording, according to Radio Free Asia, was “Being engulfed in Islamization and illegal immigration problems, we the Arkanese people look up to you as a new world leader who will change the rigged system being infested with jihadi infiltrators." International observers also fear that even Burma's champions, like McConnell and Obama, are too quick to let the country's government and military off the hook. "It's been hard in the last year because it's been going in the direction of putting less pressure on the government of Burma," said Adem Carroll, another Burma Task Force staff member. The international community seems to have given Aung San Suu Kyi a "honeymoon period," he said, since her 2015 election to the newly created post of State Chancellor, which ostensibly is equivalent to a prime minister. But despite her years of championing democracy, 15 of which Suu Kyi spent under house arrest, she's said very little about the Rohingya. "I think it's unfair to say that Suu Kyi has supported their persecution, but she certainly has not done much to try to stop it," Kurlantzick said.